It’s unusual for a high horology independent watchmaker to create a ladies watch, which is why the new 2-Eight from Kari Voutilainen is notable. Admittedly it still looks fairly masculine; its most feminine element is the mother of pearl dial centre. 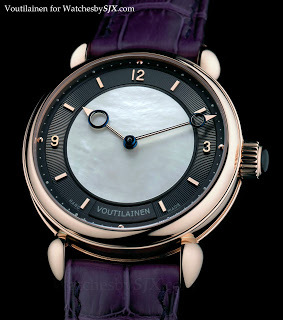 The design retains all the archetypal Voutilainen design elements like the hands and numerals. Because it’s cleaner without overly elaborate guilloche, I actually like this dial more than most of the Vingt-8 dials. Incidentally both 2-Eight and Vingt-8 mean the same thing, “28”. Case diameter is 37 mm, compared to the 42 mm of the Vingt-8. But the calibre clearly fits better in the smaller case of the 2-Eight, as the photo below demonstrates. 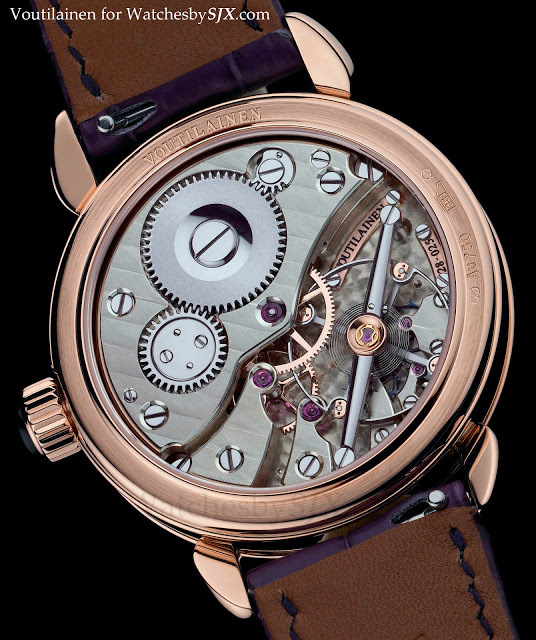 They use the same in-house movement with an oversized balance wheel and an unusual direct impulse escapement. The calibre, which has German silver bridges, is wonderfully finished, as these photos testify.